Installation completed: The last of Gemini’s 150 SWT-4.0-130 turbines has been installed, marking the completion of construction at the 600MW North Sea project. Full commissioning is scheduled for spring 2017. Transmission progress: Wikinger’s substation has been installed. All the structural components were produced at the Navantia dockyards in Cadiz, Spain and the Oleg Stashnov vessel was deployed at the project site in the Baltic Sea. Construction delay: On 15 August, the charter of A2Sea’s M/V Torben installation vessel ended, without A2Sea being able to complete installation tasks at Formosa 1. Technical failure of equipment and project delays from the foundations contractor were cited. Vessel preparation: A2SEA’s Sea Challenger installation vessel has arrived at the Dudgeon project site, in the North Sea, off east England. 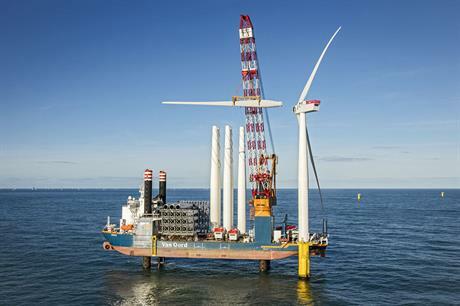 The vessel will act as an accommodation vessel for around three months, until the installation of the 402MW project’s turbines begins in early 2017. UXO complete: James Fisher Subsea has completed the removal of unexploded ordnance (UXO) at the Nordergrunde project site, 16km offshore in the German North Sea.